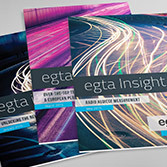 egta regularly releases publications anchored in the members’ day-to-day reality. Discover our business guidebooks, overviews as well as regular publications. Click on the button to view the relevant section or scroll down. Topical briefs on relevant TV & Radio subjects - to disseminate knowledge and raise awareness on the latest developments related audio-visual advertising. 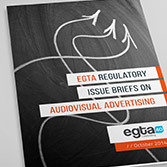 egta’s regulatory issue briefs aim at providing an overview and analysis on key policy areas for broadcasters and EU institutions alike. 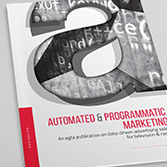 The objective of this publication is two-fold: firstly, to analyse the environment in which programmatic trading has developed as a powerful marketing concept; and secondly, to provide insights on how broadcasters may apply the underlying principles of programmatic to radio and TV, delivered by both linear and non-linear means. » Printed versions of both publications are available upon request for all egta members. For non-members, specific conditions can be discussed with Alain Beerens. Please consider that in all cases, shipping costs are to be covered by the recipient. 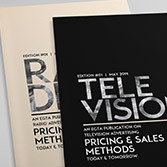 egta issued a special compilation on sales & pricing methods currently used by TV and radio advertising sales houses across Europe with a look at what is coming next and the opportunities and challenges behind automated marketing. This publications aims at providing a reference framework to all those who are questioning their current practice and are searching for new ideas with regards to inventory management, revenue optimisation and improved sales practices. 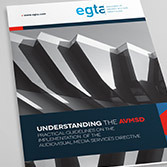 This publication gives a broad overview of the implementation of the AVMSD in different national markets. It also contains a detailed section on national and European case law relating to the transposition of the Directive up and until publication. » A printed version of this publication is available upon request for all egta members. For non-members, specific conditions can be discussed with Conor Murray. Please consider that in all cases, shipping costs are to be covered by the recipient. 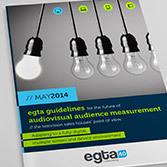 egta believes it is important not only to contribute to the debate about the evolution of audience measurement tools - and as a result, of planning and trading currencies, but it is crucial to allow broadcasters and their sales house to drive change and lay the foundations for any future solution. The guidelines are the result of working group meetings, communications with members as well as discussions with industry partners. 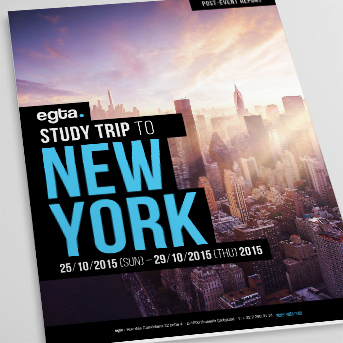 egta publishes post-event reports from its various Study Trips. These documents are available upon request for all egta members. Please contact Yuri Loburets (for radio) and Anne-Laure Dreyfus (for TV) should you wish to access the reports.